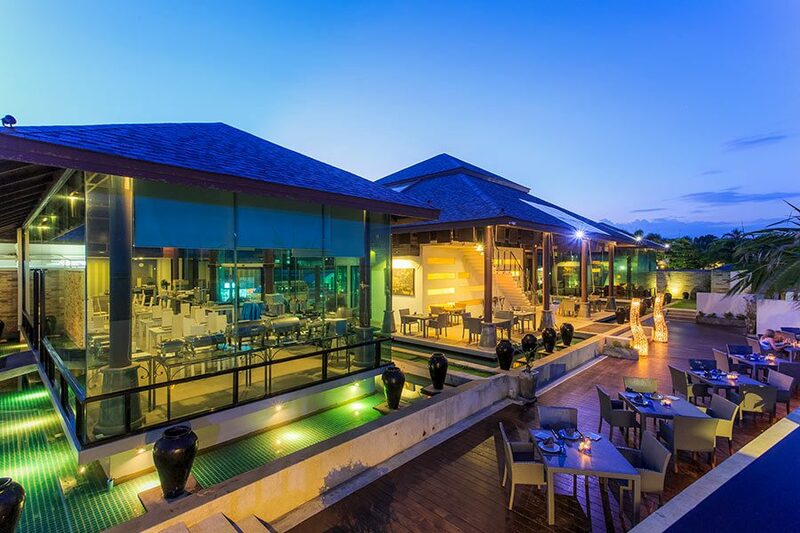 No matter where you stay when you visit Koh Samui in Thailand, you will not have an overall experience better than at the Samui Resotel Beach Resort, located on the southern end of Chaweng Beach. We stayed in a deluxe pool access room, which gave us a spacious 46 square metres with separate full ensuite including bath; tv, fridge and coffee/tea making facilities with comfortable couch; all of which opened onto our own plunge pool which overlooked the main pool area. Officially listed as a four star resort, we could want for nothing. The breakfasts were delicious with ample choices to suit every palate, and the first evening meal was so enjoyable we dined there 50% of the time. One of the features that made Samui Resotel a standout among most of the places we have stayed around the world was the staff – they were by far the most courteous, friendly and helpful you will ever find. The Thai people are known for their joyous smiles and “sawat-dee ka” (female) or “sawat-dee karp” (male), accompanied by hands joined together like in prayer and a slight bow. At Samui Resotel this was taken to a new level, with no request being a problem and it seemed like a small army of happy “aides” ready and willing to help. Whether it was selecting a nice candlelit table on the beach for a romantic dinner; booking the resort’s air-conditioned van to drive us around the island; or getting directions to the main shopping centre or the best places to visit, advice and service was quickly provided with a laugh and a smile. The resort itself was ideally situated for all but party-goes who want to be right in the heart of the party scene. 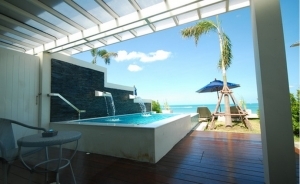 With about 200 metres of “private” oceanfront beach and some 90 beachfront villas, poolside units and upstairs apartments with views, Samui Resotel was perfect for us. We had the beach at our doorstep; it was only a one-minute walk to a 7/11-type store which also sold really cheap alcohol; banks and money exchanges were plentiful; and several kilometres of bars, markets and restaurants started less than 200 metres from our front door. Importantly for us, “party city” started about 10 minutes walk away, which meant were we able to retire and sleep peacefully at 10pm or 11pm, undisturbed by the thousands having a great time nearby. Spacious units with private pool and courtyard. Combinations of one King size bed and one single or two queen size beds, oversized bath tub and walk in wardrobe. Beautifully laid out for a luxurious private holiday. With direct access to the main pool and pool bar, the deluxe pool access rooms are perfect for those wanting to have views over the pool and those who enjoy watching the pool activities. 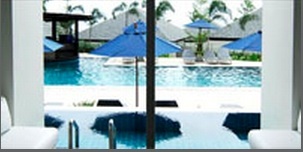 Each unit also has it’s own plunge pool and day bed with spacious patio. 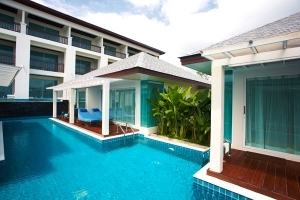 If you are planning to visit Koh Samui we suggest to contact Samui Resotel Beach Resort directly and see what they have to offer. 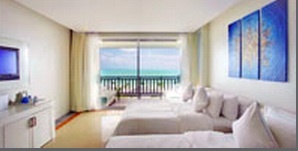 Address: 17 Moo3 Chaweng Beach, Bophud, Koh Samui. Rooftop lounge – enjoy the view across the ocean while sipping on a cocktail. Every guest we spoke with had nothing but praise for the resort and the service provided, which is why this is ranked as one of our top holiday destinations around the world. We recently went to Koh Samui…what a beautiful island, the beaches, the mountains, the people, what a great place! We stayed on the southern end of Chaweng Beach, which is very popular to the tourists. 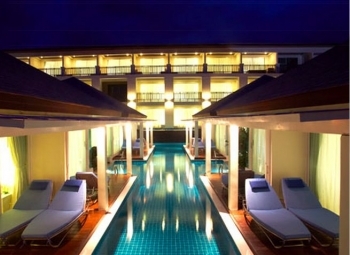 Because we are a little older we like a good night sleep so the Samui Resotel Resort & Spa was perfect for us. The staff were so friendly and helpful and even remembered our names every morning. The Buffet breakfast was a" big hit" with my husband, everything from fresh fruit (the pineapple was the best we have ever had), bacon and eggs cooked as you want them, and delicious cakes. What more can I say !! The resort is right on the beach, with deck chairs and bar service. In the afternoon after a bit of shopping (of course) the pool bar was great for cocktails with happy hour offering two for the price of one. We were very sad to leave when our holiday came to an end. Just leaving the friendly Koh Samui faces that had become like family in our short stay was very difficult.